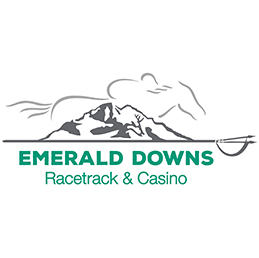 (Auburn, WA) It was closing day at Emerald Downs for the 2018 live racing season. 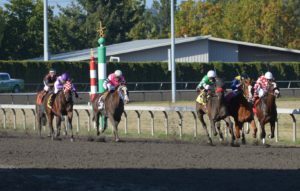 4 Stakes races highlighted by the $100,000 Getaway Day Stakes and the $50,000 Gottstein Futurity. 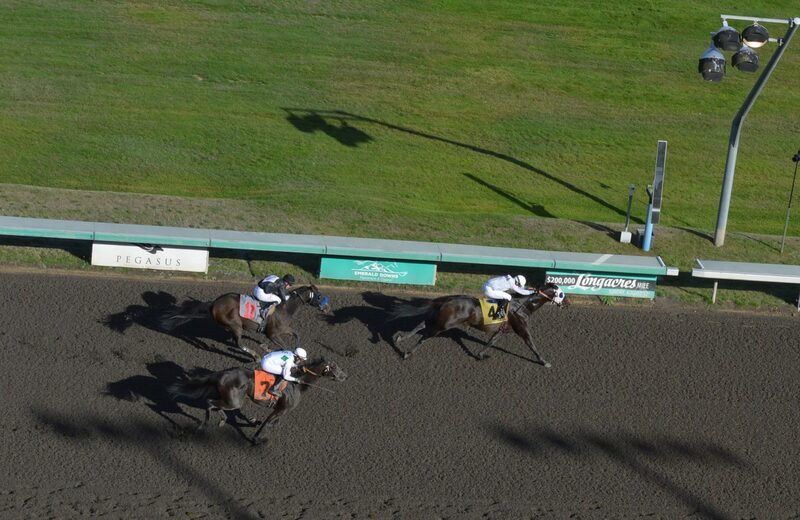 With 100k on the line it was a 6-1 outsider who ran down the favorites and longshot pacesetter for the win. Yulong Warrior shipped in from Del Mar and brought So Cal jockey Evan Roman with him. 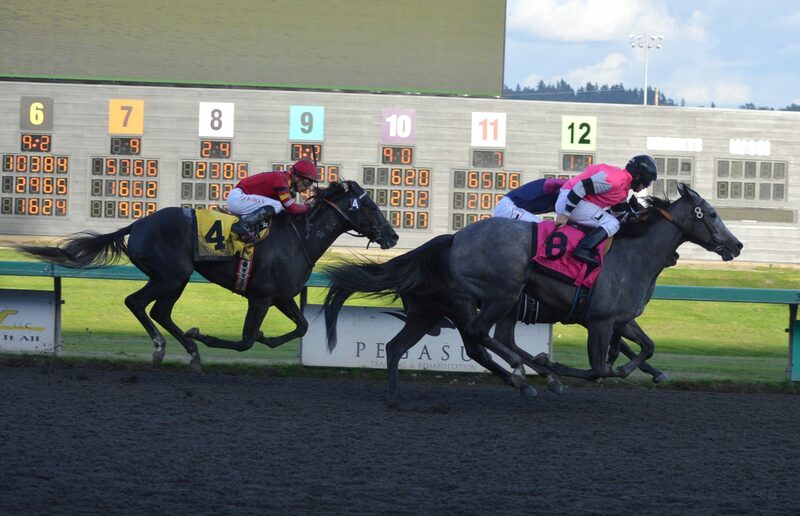 As the gate sprung for the 1 1/16 race Roman laid off a solid early pace set by Boundary Bay and Javier Matias. 2nd favorite Weekend Wizard with Rico Walcott was never far behind Bay and turning for home took the lead. Heavy favorite Sippin Fire, who was trying to tie the record for Stakes wins in a season with 5 was poised to make a run on the outside with regular rider Rocco Bowen but simply flattened out and finished 4th. Warrior had ridden the rail until swinging out turning for home and Roman found plenty of room to the outside of the Wizard. 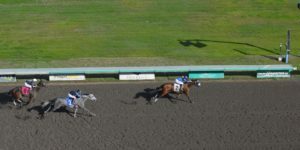 In deep stretch Warrior flew past Weekend Wizard to win by a little more than a length. 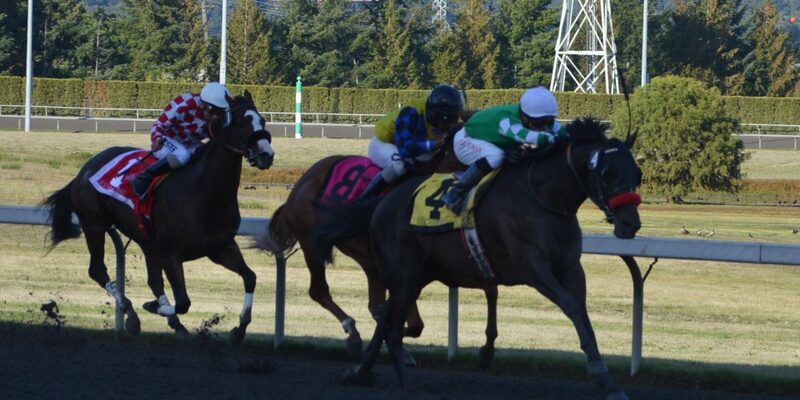 Boundary Bay held well to take 3rd, 3/4 length in front of Sippin Fire. 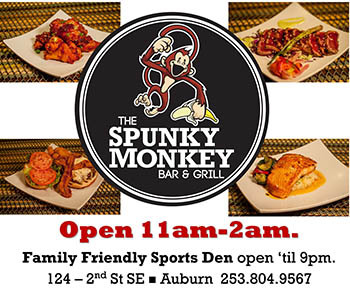 Yulong Warrior banked $53,000 for the win and returned $14.80 on the $2 win. Warrior covered the 1 1/16 in 1:40.61 and is owned by Yuesheng Zhang and trained by Doug O’Neill. 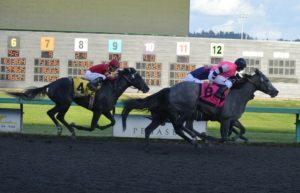 The sting of an even performance from odds-on favored Sippin Fire for the owners, the How We Roll #4 Stable and trainer Steve Bullock disappeared when their 24-1 longshot Northwest Factor came rolling home in the 50k Gottstein Futurity. It looked like the Factor would be just another outsider taking his shot at a big purse and running near the front end but would eventually fade. But every now and then that front speed doesn’t quit and Bullock had plenty of wind in his charge and jockey Gary Wales knew how to manage it. Northwest Factor never more than a couple lengths behind front runner Fuzzy Dolphin also did not engage in a suicide style pace and dug in at the top of the stretch. No doubt Wales knew closers were coming but had no idea until Time N Time Again come up on him to his inside. 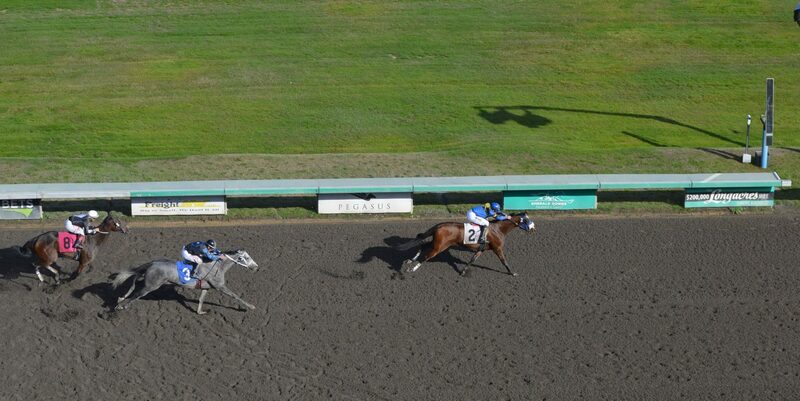 The Factor held off the fast closing 9-1 shot to win by a head. Moderate favorite Palladium was also closing on the far outside but ran out of stretch to get any closer than 3rd. Wales knew he held on for the win and was jubilant in the ride out but also had no idea of the chaos that Time N Time Again was involved with at the top of the stretch. 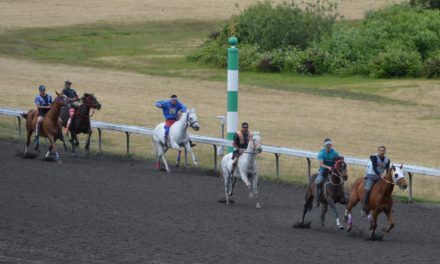 Jockey Julien Couton launched his bid on the turn while Frolic and Detour with Eswan Flores aboard was firing along the rail from further back. 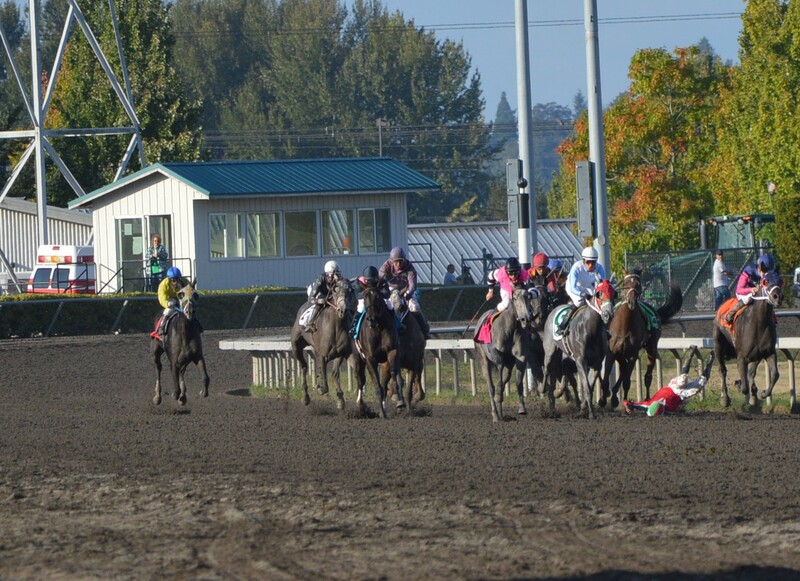 The paths collided at about the 1/8th pole when Couton and Time dove toward the rail squeezing Frolic who jammed on the brakes and ended up dumping Flores on the track. 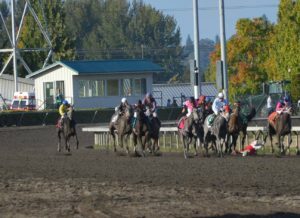 The good news was Frolic and Flores both escaped serious injury as frolic ran off and Flores walked off and in fact would win the 10th race. The stewards posted the inquiry sign and took Time N Time Again down for interfering with Frolic and Detour and was placed last. The official order of finish was Northwest Factor, Palladium, Fuzzy Dolphin and Mr Frank as the top 4. Northwest Factor returned $50.80 for the $2 win and stopped the clock in 1:44.99. After a very chalky start to the final day racing card once the 4 straight Stakes races began was the end of favorites visiting the Winners Circle. 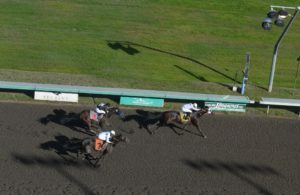 In the 5th race, 3rd favorite No Talking Back with Jose Zunino fired from 5th place on the far turn and drew off to win by more than 2 lengths. 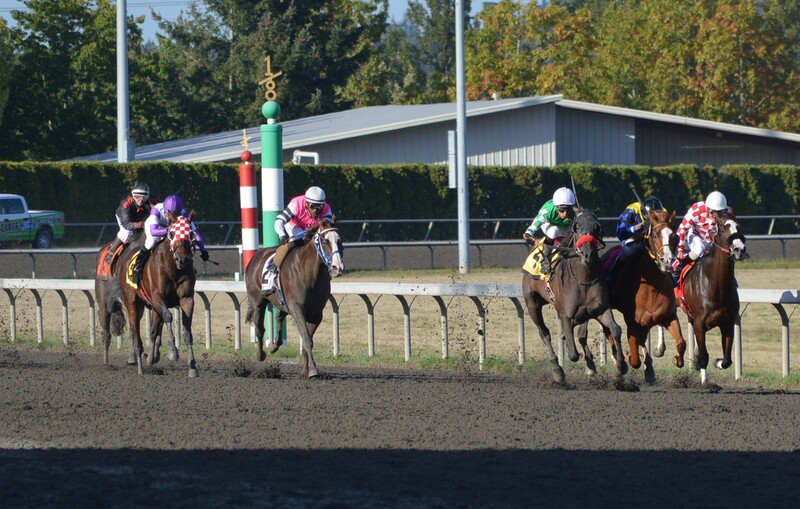 9-1 Blazinbeauty came from further back to close fast for the place and 2nd favorite Fly Far Away ran 3rd. No Talking Back covered the mile in 1:35.98 winning the 25k Fan Appreciation Day Stakes and returned $10.80 for the $2 win. No Talking Back ran for the One Horse Will Do Corp and Steve Shimizu and trained by Chris Stenslie. In the 6th race, the Pete Pederson 25k Overnight and Eswan Flores guided Hit the Beach to the Winners Circle at the eye catching odds of 13-1. Mixo at 12-1 with Kevin Orozco closed well to get 3rd over favored Oh Marvelous Me. The 2 longshots combined to return $140 on the $1 exacta. Hit the Beach laid just off the pace up the backstretch of the 6 and a half and held a slight lead at the top of the stretch. Flores got after Beach and pulled away for nearly a 2 length win. Hit the Beach is trained by 90-year-old HR Pat Mullens and owned by Mullens, Ed Zenker and Richard Larson.